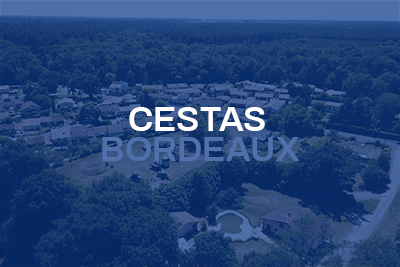 Part of the ‘Landes de Bordeaux’, 16km southwest of the city, Cestas is a commune in the Bordeaux urban area. Dating back to pre-history and a stopover for Roman armies marching north from Spain (Cestas literally means ‘the sixth military milestone’ before Bordeaux – a day’s march), the town is dotted with lakes and natural springs nestled amongst 600 hectares of pine forests. It’s the source of the Eau Bourde river wildlife zone, which runs towards Gradignan and has three large parks with tens of kilometres of walking trails and 25km of bike tracks. Lac Vert, les Sources de Peugue and Cap de Bos are well worth a visit. Cestas borders Pessac, Canéjan, Saucats, Le Barp, Mios, and Marcheprime, and is effectively cut in half by the A63 motorway, which runs south from Bordeaux towards Arcachon and Spain. With a range of suburban zones including Cestas-bourg, Gazinet, Jauge, Labirade, Pierroton, Réjouit and Toctoucau, the town has attractive property prices and is within easy striking distance of Bordeaux. It has ample shops and facilities and is on the Prox’Bus public transport network, which links up with Unitec tram near the university. Cestas Gazinet station also has regular trains to Bordeaux which is 12 minutes away. Proudly displaying its Gascon/Landes heritage, there is a large pelote pitch near the center as well as an indoor court next to the Super U supermarket. There are a range of other sports on offer at the SAGC sports complex, which has facilities for most ball sports as well as a dojo and its famous indoor ‘Sunflower’ swimming pool. It’s also home to one of the best table tennis teams in France.